Greg grew up boating in Michigan as a boy. 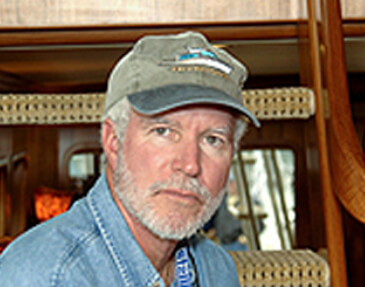 He moved to Fort Lauderdale in 1974, purchased a 26' sailboat and set sail to the Bahamas. He was hooked! He later became the dealer for Islander and Tartan sailboats... and the rest is history! In 1985 he opened his Rampage dealership, which also represented Four Winns, Contender, Sunseeker and Nordic pilothouse yachts. In 1993 he became the east coast distributor of Offshore Yachts and built custom pilothouse motor yachts at four boatyards in Taiwan ranging from 48 —90'. He made numerous trips to the factories overseeing all phases of construction including layout, electrical, plumbing, hydraulic, décor, etc. Supervising all of these elements gave Greg the understanding and incredible knowledge of all phases of yacht construction. Fast forward fifteen years and Greg branded a new line of custom yachts he named "Out Islander". His obsession drove him to build the perfect cruising yacht a couple could owner operate. Cruising with his family for all those years gives Greg the hands on experience and knowledge of a seasoned captain, and many of the well thought out designs and systems in the boat reflect that. Teaming up with Luke Brown enables him to bring his knowledge of new build construction and brokerage to the table.